We produce oil and gas in the Gulf of Mexico, heavy oil in California and primarily tight gas and associated liquid hydrocarbons in Louisiana, Pennsylvania, Texas and Wyoming. The majority of our oil and gas production interests are acquired under leases granted by the owner of the minerals underlying the relevant acreage (including many leases for federal onshore and offshore tracts). Such leases usually run on an initial fixed term that is automatically extended by the establishment of production for as long as production continues, subject to compliance with the terms of the lease (including, in the case of federal leases, extensive regulations imposed by federal law). The Gulf of Mexico is the major production area in the USA, accounting for almost 50% of Shell’s oil and gas production in the country. We have approximately 420 federal offshore leases in the Gulf of Mexico, about one-fifth of which are producing. 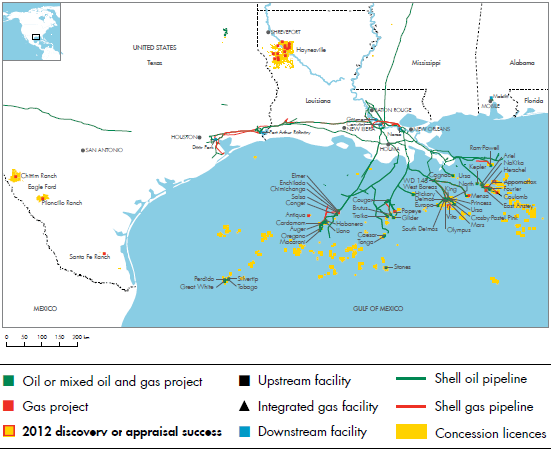 Our share of production in the Gulf of Mexico averaged almost 190 thousand boe/d in 2012. Key producing assets are Auger, Brutus, Enchilada, Mars, NaKika, Perdido, Ram-Powell and Ursa. We continued to grow our presence in the Gulf of Mexico, with the addition of two drilling rigs to our contracted offshore fleet in 2012. We also secured 24 blocks in the 2012 central lease sale for a sum of $400 million. 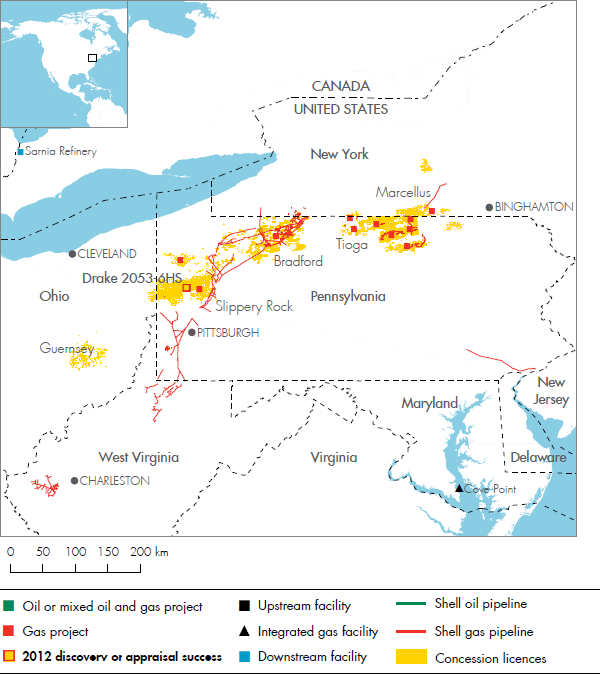 We hold more than 15,000 square kilometres of tight-gas and liquids-rich shale acreage. 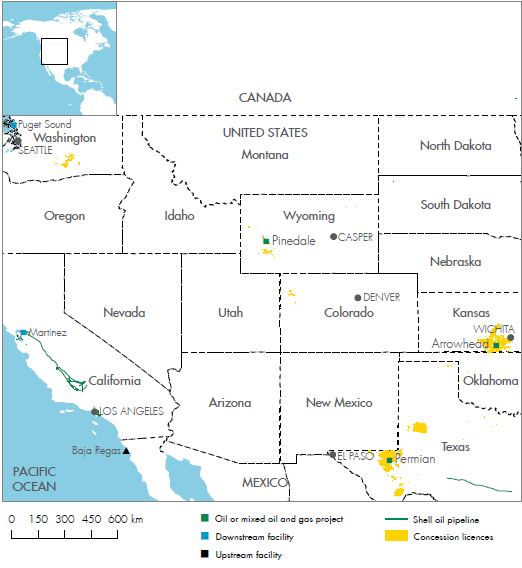 This includes significant holdings in the Marcellus shale, centred on Pennsylvania in northeastern USA, the Eagle Ford shale formation in south Texas, the Sand Wash and Niobrara Shale in north-west Colorado, as well as the Mississippi Lime formation in south-central Kansas. In 2012, we also acquired approximately 2,200 square kilometres of mineral rights, with an additional 300 square kilometres linked to contractual conditions, in the Delaware Permian Basin in west Texas. We hold a 51.8% interest in Aera Energy LLC (Aera), which holds assets in the San Joaquin Valley and Los Angeles Basin areas of southern California. Aera operates more than 15,000 wells, producing about 130 thousand boe/d of heavy oil and gas. 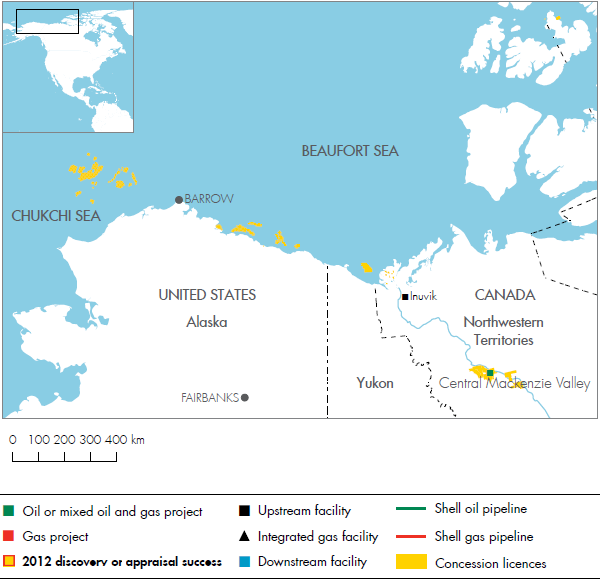 We hold more than 410 federal leases for exploration in the Beaufort and Chukchi seas in Alaska. During the 2012 drilling season, we drilled two exploratory wells, one each in the Beaufort and Chukchi seas. These wells are known as top holes as they do not go deep enough to reach hydrocarbon reservoirs. After drilling they were safely capped in accordance with regulatory requirements.